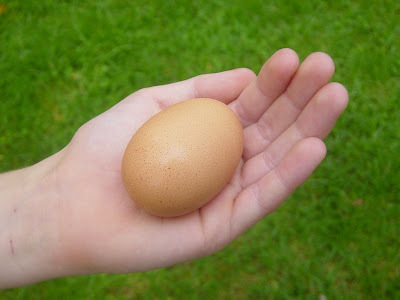 I am proud to say that our chickens (well, one of them) have laid their first egg! We have been waiting and waiting (and wondering how much we were going to spend on food for them without seeing any result!) and finally yesterday we were surprise to find a nice brown egg in the egg box! 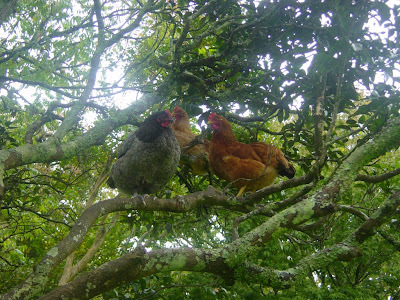 Our chickens have taken a liking to roosting high up in one of our orange trees (pix below) - which means they would rather stay there for the night than go off home to their house (as they usually did before). Funny things! Anyone have any tips or ideas as to why they are loving it so much up there? Their names are Buttercup (New Hampshire Red), Daisy (Blue Australorp) and Cornflower (Buff Leghorn) and they are very cute, in a wierd sort of way. How totally cool! I would love to have chickens but not allowed to here in central Auck. Instead I fork out for free range - you so can tell the difference! My bro-in-law used to have a lifestyle block and they had chickens roaming. They'd find eggs in the weirdest places - hidden in the bamboo hedge. I'll ask him about the "what to dos" next time he's around.